Iraqi protesters on Friday torched the Iranian consulate in the southern city of Basra in fresh demonstrations over poor public services after parliament called for an emergency session on the unrest. Unidentified attackers also fired shells into Baghdad’s fortified Green Zone in a rare attack on an area that houses parliament, government offices, and the U.S. embassy. There were no casualties. 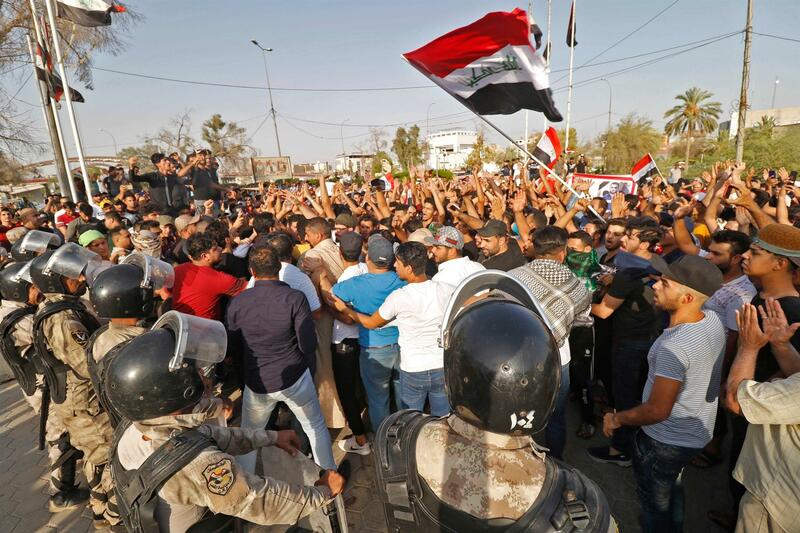 Basra has seen a surge in protests since Tuesday, with demonstrators torching government buildings as well as political party and militia offices, as anger boils over after the hospitalization of 30,000 people who had drunk polluted water. Thousands of demonstrators rallied outside the Iranian consulate on Friday while hundreds stormed the building and set it on fire, an AFP photographer said. Iran’s Foreign Ministry spokesman Bahram Ghassemi denounced the incident as a “savage attack”, according to Iranian news agency Fars. Iran is a key power broker in Iraq and many of the militias and political parties whose offices were torched Thursday are known to be close to the Islamic republic. Parliament said that lawmakers and ministers, including Prime Minister Haider al-Abadi, will meet on Saturday to discuss the water contamination crisis, the latest breakdown in public services to infuriate residents. And the representative of Grand Ayatollah Ali Sistani, spiritual leader of Iraq’s Shiite majority, in his Friday sermon denounced “the bad behavior of senior officials” and called for the next government to be “different from its predecessors”. Human rights activists have accused the security forces of opening fire on the demonstrators. But the government has blamed provocateurs in the crowds and said troops have been ordered not to use live rounds. Amnesty International on Friday denounced “the use of excessive force by security forces” and called for an investigation into the deaths. The anger on Basra’s streets was “in response to the government’s intentional policy of neglect” of the oil-rich region, the head of the region’s human rights council Tamimi said. Sadr on Thursday called for politicians to present “radical and immediate” solutions at the emergency meeting of parliament or step down if they fail to do so. Abadi, for his part, is trying to hold onto his post in the next government through forming an alliance with Sadr, a former militia chief who has called for Iraq to have greater political independence from both neighboring Iran and the United States.